A man punched and kicked in the head by two Georgia cops during a traffic stop told NBC News that he earlier had an "encounter" with one of the officers. A second video later surfaced that purportedly shows Hollins being punched in the face by Sgt. Michael Bongiovanni as he stepped out of his car in Lawrenceville, Georgia. Bongiovanni and McDonald were both fired over the incident Thursday and criminal investigations launched. "I was actually trying to get to the camera app because I actually kind of had an encounter ... with the particular police officer before and he charged me with the same charges as he charged me with yesterday," said Hollins, who was booked for marijuana possession, obstruction and multiple traffic violations. "He start[ed] shoving me in my car and telling me that I was never going to have a video, that I was never going to make the phone call to my mom," he told NBC News in an exclusive interview. "When I had my hands up, that's when he punched me in the face." As Hollins lay handcuffed on the ground, "another cop came out of nowhere and stomped me in the face." 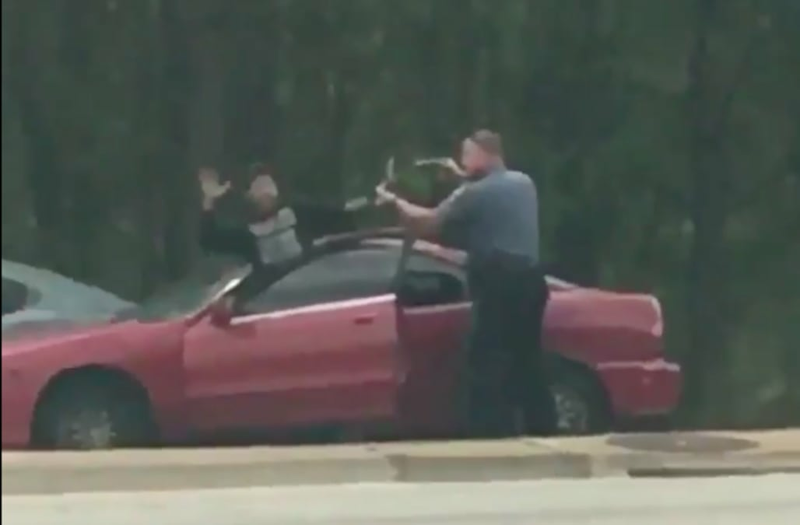 The Gwinnett County Police Department said in a statement that the incident occurred Wednesday and that videos confirmed "the force used was unnecessary and excessive." It also added that Bongiovanni had lied about the incident and "stepped outside of his training and state law." "We acknowledge that the actions of these two officers have implications that will be felt for some time," the statement continued. "However, we also believe that our decisive action in terminating both officers speaks volumes about what is expected of each officer that wears a Gwinnett County Police badge." Police chief Butch Ayers later said there was "literally no excuse for behavior like this." Hollins' lawyer, Justin Miller, said the incident would likely have been gone unreported if it had not been caught on video. "The fact that these guys felt so brazen as to ... assault him in public in broad daylight in front of hundreds of onlookers and hundreds of cars is indicative of what they think is OK."
Without the videos "they would have painted him as the bad guy, arrested him, brushed it under the rug and probably did it to them again the next time they saw him." Eyewitness, Kenneth Dillard, shot the first video that surfaced and said he was shocked by what he witnessed. "You don't picture yourself seeing a police officer do that live and in person," Dillard said. Earlier this week, video surfaced of an officer in Sacramento, California, slamming then beating a pedestrian stopped for alleged jaywalking.